I have got to the point in pregnancy where the most important aspect of an outfit is comfort. I can still wiggle into my maternity jeans and put on some socks, but all I want to wear are dresses and slip on shoes with no waist bands and no reason to struggle and reach my feet. The weather isn't quite warm enough to live in summer dresses yet, but we are well into Spring now so I am holding on to it warming up soon. 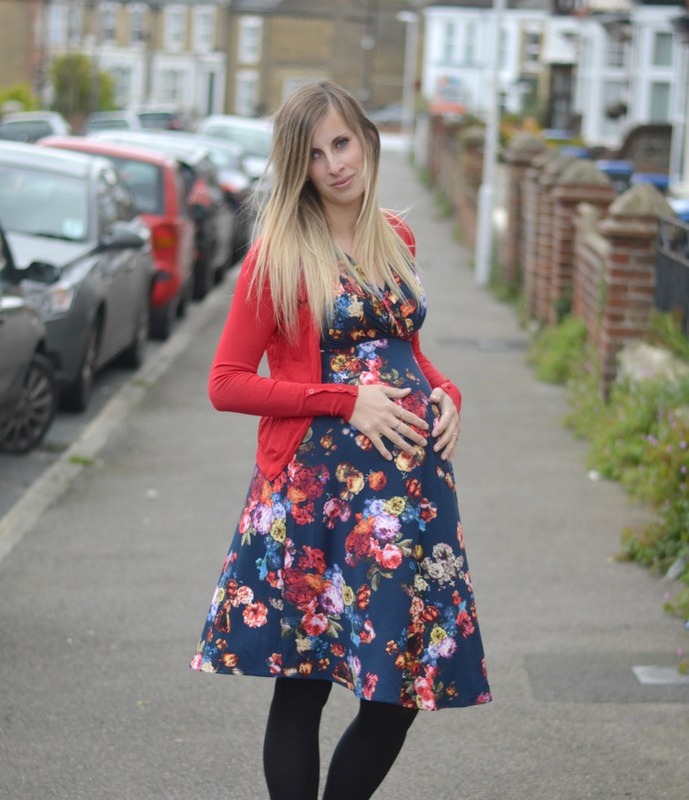 Luxury British designers Tiffany Rose sent me a couple of their maternity dresses and they are by far the most comfortable things in my wardrobe right now. They specialise in occassionwear, but with nothing to dress up for on the horizon I opted for a couple of dresses that I could dress down enough to get away with as day wear. Maxi dresses are the ultimate summer maternity item and this one is just beautiful. It is lined which helps it hang well (and stops the white becoming see through), comfortable and amazing quality. The cut is flattering throughout pregnancy and would last from a tiny bump until after baby arrives - I don't think I will be packing this away just because my bump has gone. I often find that this style of dress comes up short as I am 5 foot 9, but this one is a great length that I am not tripping up over it, but it still is nice and long. I love how this dress can work for so many different occassions, on its own it would look wonderful for a summer wedding or Christening, but paired with a denim jacket and flipflops it is casual enough for everyday wear. The second dress was a shorter length but a similar style with the same crossed over top and empire line cut. As the weather wasn't as nice I wore it with tights and flat shoes but my plan is to wear this with just sandals and a cardigan or jacket to dress it down in the summer, but maybe put on some low heels if I want to wear it out too. It felt wonderful to wear and I had so many compliments. The rich blue colour is really stunning and I found it incredibly flattering on my changing figure. Tiffany rose are proud to be designed and manufactured in the UK and their dresses are made to the highest quality and come beautifully packaged too. These dresses are currently £84 and £89 which I think is great value considering the outstanding quality. Thank you to Tiffany Rose for sending over these beautiful dresses.